From a teak clubhouse where British officers once sipped gin to an old English department store dubbed "Harrods of the East" -- the race is on to save Myanmar's colonial jewels from the wrecking ball. 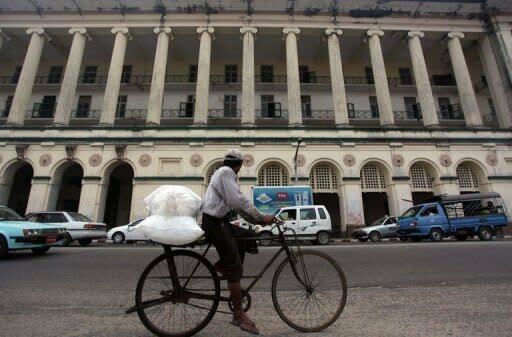 Six decades after the country also known as Burma won its independence, the grandeur of the British Raj lives on in the elegant but crumbling 19th and early 20th century buildings that dot the former capital Yangon. But as the nation emerges from decades of military rule and investors flock to what they hope will be the region's next hottest economy, experts fear that Myanmar's largest city could soon lose its architectural treasures. Hundreds of colonial buildings have already been torn down in what was once one of Asia's top trading hubs, many falling prey to a building boom and a wave of property speculation, as high-rise buildings mushroom around the city. "Unfortunately I would say half of the residential buildings that are 50 years or older in downtown Yangon have been knocked down over the past 10 years," said historian and writer Thant Myint Oo, founder of the Yangon Heritage Trust which is spearheading a preservation campaign. "We have enough left that Yangon can still be a very special and unique city," he told AFP. "But the fear is also that in five years' time it could look like any other Asian city with skyscrapers and traffic jams and not much else to distinguish it," he added. The trust's goal is to have a statutory list of protected buildings as well as official regulations on standards of renovation. An existing heritage list, compiled by the city authorities, includes about 180 buildings but offers no legal protection. 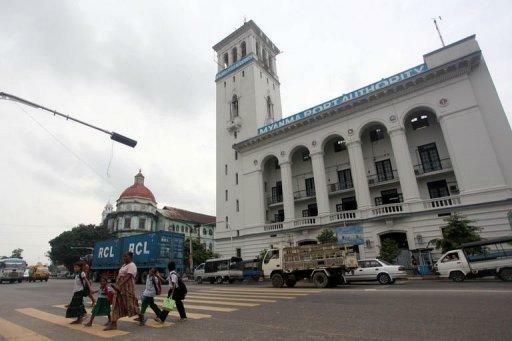 They include the former Reserve Bank of India, the colonial rulers' central bank; the Secretariat, the one-time seat of the colonial-era government where independence hero General Aung San was assassinated in 1947; and the former headquarters of the mighty Irrawaddy Flotilla Company. Hundreds of other residential buildings are not listed, while a number of landmark properties once filled by government ministries now stand empty after the regime moved the administrative capital to Naypyidaw in 2005. Others, such as the former Rowe & Co. Department Store -- later the office of the Immigration Department -- have been snapped up by local tycoons who grew rich thanks to their ties to the generals who ruled for decades. Jade mining and construction magnate Zaw Zaw plans to turn the dilapidated Rowe & Co. building in downtown Yangon into a luxury hotel to rival the nearby Strand, considered one of Yangon's finest restored colonial buildings. In its heyday, the storied emporium attracted hordes of wealthy Europeans and well-heeled Asians, including a Shan Princess who described it as a "veritable Harrods of the East" in her memoirs, according to a new book from the Association of Myanmar Architects titled "30 Heritage Buildings of Yangon." The Strand Hotel, a colonnaded landmark on Yangon's waterfront built in 1901, played host to guests including George Orwell, Somerset Maugham, and Noel Coward, while Rudyard Kipling spent an evening at the Pegu Club across town. The former Gentlemen's Club -- where British government officials and army officers played billiards and shared tales of battle -- is a shadow of its former glory, slowly rotting and falling down. But an example of the potential it holds can be seen in the Governor's Residence, a 1920s teak mansion that is now a luxury Yangon hotel. The monsoon rains and cyclones that pound the city have taken their toll on many of the colonial-era gems which are in need of urgent renovations. "I have no illusions on the challenges we face," Yangon Mayor Hla Myint told a recent conference organised by the Yangon Heritage Trust to look at ways to preserve the city's architectural treasures. "There are technical challenges. Many of these buildings have not been repaired or renovated properly in a long time. There are financial challenges. There are challenges related to regulation and the redrafting of laws. But I believe what we are setting out to do is doable," he added. The project appears to have the support of Myanmar's new reformist government, which sees foreign investment and tourism as crucial to the future of the impoverished country. "We all need to protect the nation's heritage," Industry Minister Soe Thein told the same forum. The challenge is how to preserve and restore the colonial jewels while also meeting growing demand for office space and modern accommodation, and without leaving the people who call the ageing properties home left out on the street. Inevitably, perhaps, restoration means the city also risks losing the faded grandeur that for main people is its main charm. "What I really love about Yangon is how it's been preserved very unartificially," said Yangon-based architect Amelie Chai, whose company Spine Architects has helped to renovate a number of colonial-era properties. "All those communities are living, working in these buildings without any government interference and nobody telling them you have to maintain this colour or whatever," she said. "Some people think that's terrible because some of the buildings are falling into disrepair, but on the other hand to me that's the most special part of it."